Hello everyone. It’s been a while since I participated in Mixology Monday, but somehow, no matter how you try to escape the shrouded underworld of artisanal mixology blogs, it finds a way to draw you back in. This month our host is Ceccotti over at Bartending Notes, and the theme is pineapple. Be in a tiki cocktails, an old school classic like the Algonquin, a crazy flavor pairing or just mixed in a delicious Verdita, get creative and make a cocktail using any part of this delicious, juicy fruit or share you favorite pineapple cocktail with us! I couldn’t make up my mind so I decided to do a series of drinks investigating some of pineapple’s lesser-known affinities. The aromatic of the hour is a molecule called methyl hexanoate, which can be found in coffee, pineapple, white wine, hops, kiwi, and oysters, among other things. And although I am definitely crazy enough to put oyster brine in a pineapple cocktail, that particular experiment will have to wait. Long-time readers may remember when we capitalized on this commonality in the past with a blue cheese and pineapple pairing. I am still drawing a lot of inspiration from my mixology tour of Tokyo, and for this MxMo I decided to apply the same technique I used for the Carrera to try to bring the flavor of pineapple to the fore. For all of these drinks, my process and template were the same: I mixed an ounce of fresh pineapple juice with an ounce of the other main ingredient in the drink, tasted it, adjusted the ratio, padded it with vodka, and sweetened it with simple syrup. In order to maximize the flavor of the pineapple, I cut a pineapple into rings and roasted them in the broiler until the surface became caramelized and brown. The smell of roasted pineapple filled my whole house, and this is something that I would wish for you, as well. If you have a grill, you could grill the pineapple instead of roasting. I then muddled the roasted pineapple into the drink to provide cooked and caramelized pineapple flavors along with raw and fresh ones. The ratios of ingredients are kind of all over the place. I’m sorry for that. I like my drinks to be properly jiggered but in these lower-alcohol drinks, jiggers start to matter less. I think we’ve learned the rules sufficiently at this point that we can break them when we want. Muddle roasted pineapple with vodka until its juice is thoroughly extracted. Add other ingredients and then shake over ice. 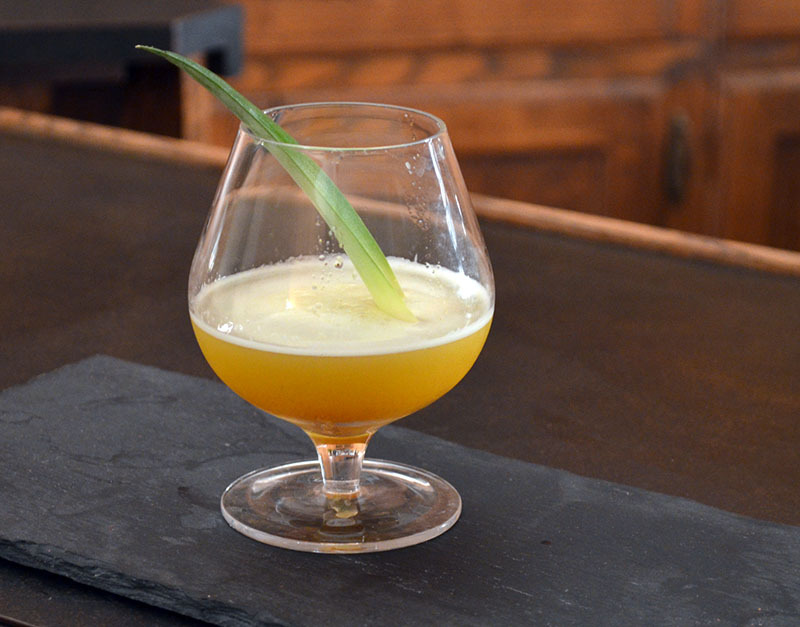 Double strain into a coupe glass and garnish with a pineapple leaf. *My barspoon is 1/8 of an ounce. This drink was the lightest in the series, probably too light. I considered using a white wine reduction, but although this pairing is unobjectionable, it is not more than the sum of its parts. The most intriguing thing about this drink was the way that the vodka brought out the other flavors. Before I added the vodka, the taste of this drink was flat and bland, but adding the vodka somehow turned up the volume on both the pineapple and the wine. Even so, I wouldn’t remake this. Muddle roasted pineapple with vodka until its juice is thoroughly extracted. Add other ingredients and then shake over ice. Double strain into an old fashioned glass and garnish with a pineapple leaf. If you enjoy IPA, you will probably love this. Pineapple and IPA were meant to go together. Don’t overcomplicate things by putting other flavors into the mix. As with the above, the vodka helped to increase the perception of contrast between the flavors. Especially after drinking this, I can discern prominent notes of pineapple in an IPA all on its own. Muddle roasted pineapple with vodka until its juice is thoroughly extracted. Add other ingredients and then shake over ice. 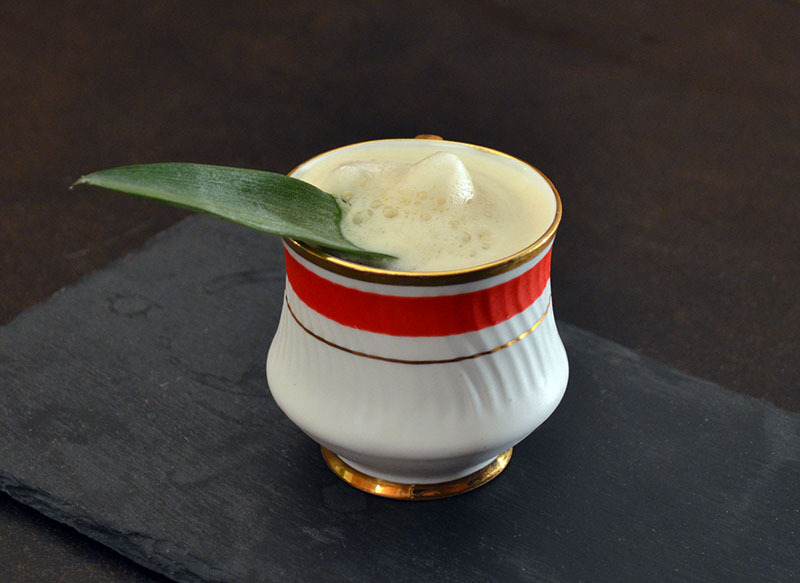 Double strain into a small mug and garnish with a pineapple leaf. I don’t know why, but I felt like calling this “Ocelot”. Probably I have been watching too much Archer. In any case this was the best of the bunch. Coffee and pineapple both froth up pretty fiercely when you shake them, so after I double-strained this drink, I used my barspoon to get some of the froth sitting at the top of the strainer onto the top of the drink. 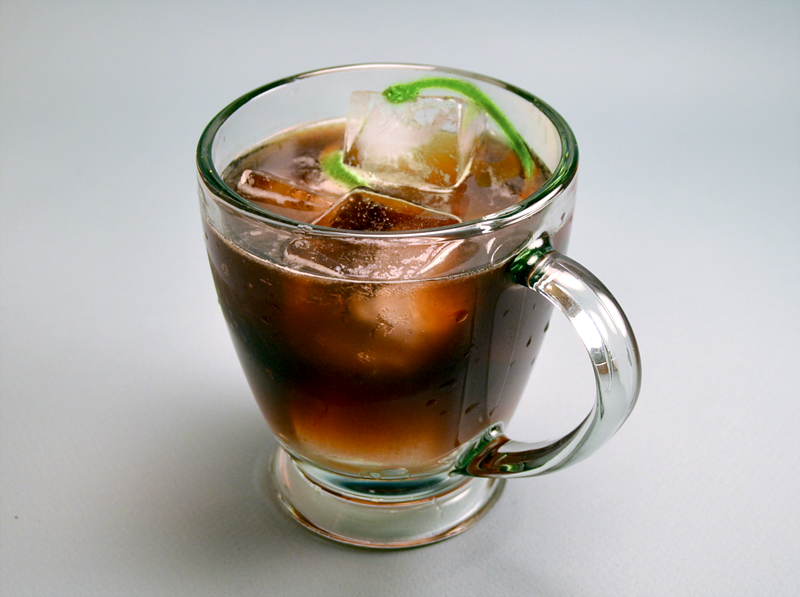 In my first version of this, I used simple syrup instead of coffee liqueur, but I wanted to reinforce the flavor of the coffee a little more. If you make a drink from this post, this is the one. Crush the cloves in the vodka with a mortar and pestle, then add the vodka to your measuring tin with the roasted pineapple. Muddle and add all other ingredients. Shake and then double strain into a snifter and garnish with a pineapple leaf. I broke the mold with this one. When one has a pitcher of fresh pineapple juice, it is advisable to make something in the genre of tiki. I was originally going to call this a “minimalist” tiki drink, but upon looking at the ingredient list I’m not sure if I can get away with that. This was my second pick from this cocktail lab, though I think I need to explore the concept of a curried pineapple drink a little further. It’s not perfect yet. I’d like to close up by saying a bit thanks to Ceccotti for hosting MxMo, and a big thanks to you for reading. As they say in Hawaii, Huli pau! Categories: modern drinks, original creations, tiki | Tags: alcohol, bartending, Beer, booze, chardonnay, cloves, cocktail, cocktails, coffee, craft cocktails, curry, drinking, drinks, hops, IPA, liquor, mixed drink, mixed drinks, mixology, mixology monday, mxmo, pineapple, rum, spirits, tiki, vodka, White Wine, wine | Permalink. Hey guys, sorry I missed our usual Monday rendezvous. Last month, Mark Holmes over at Cardiff Cocktails was inspired by our beer week to make a drink with tequila and porter, which he called the pina porter. I found it through his twitter, and then I tweeted back at him that I loved the idea of pineapple juice and porter… that was probably confusing. Anyway, James and I made the drink to spec, and it suited our fancy. It seems that when Mark made it, he got a much fizzier head on his drink than we did, but ours was fizzier than it looks, I assure you. The kahlua + porter worked really well, but we made the mistake of using a not-smokey-enough reposado. I enjoy a lot of smoke in my tequila, and I was looking for the smoke to complement the beer. We added a quarter ounce of mezcal to the drink, post-mix and post-photograph, and it corrected the problem, but I think it would not have been a problem in the first place, had we used a smokier reposado. So thanks a lot, Mark, it was a good one. Categories: modern drinks | Tags: alcohol, bartending, Beer, booze, caramel, caramel syrup, cocktail, cocktails, craft cocktails, drinking, drinks, kahlua, lime, liqueur, liquor, mixology, porter, spirits, tequila | Permalink. This week is beer cocktail week, so we’ll be posting a series of beer drinks. Today’s drink came together almost on its own, although its construction was controversial. Joe and I were trying to think of something to do with his bottle of Suze, maybe a spirit-driven drink. We came up with an idea and had something that tasted marvelous, but then Joe wanted to pour beer all over it. We debated whether or not we should add beer for about five minutes, and in the end Joe convinced me and we did it. I must say that it was worth it. Stir over ice, strain. Top with 2.5 oz Spaten Optimater (or any doppelbock will do). Garnish with an orange twist. The beer we chose was Spaten Optimater, which is a dark German malt beer. On its own, it has a floral, malty, toasty bouquet and tastes of dark fruits – maybe prunes – and caramel, and finishes with a slight bitterness. What convinced me about this beer? Well, it just tastes great with bourbon. Also, this is one of Joe’s all-time favorite beers (as well as his father’s, so I’m told), and so in it went. Even without the beer, this drink tastes great. With the beer, though, it tastes even better, although it does loose a bit of its hard edge. The beer’s caramel and dark fruit flavors complement the bourbon, and its sourness emphasized the bitterness of Suze. The creole shrubb is almost a cheater’s ingredient (it’s so tasty! ), and the citrus notes in the beer help it feel at home in the glass. Categories: modern drinks, original creations | Tags: alcohol, angostura bitters, bartending, Beer, beer cocktail, beer week, bitters, booze, bourbon, cocktail, cocktails, craft cocktail, craft cocktails, creole shrubb, doppelbock, drinking, drinks, liqueur, liquor, malt beer, mixed drinks, mixology, orange liqueur, orange peel, spirits, suze | Permalink.